Your Search Engine for all things about cleaning! When a spill happens and the intercom rings for a cleanup, every custodian in the world grabs the same old tired, dirty, stinky, dust pan and broom along with the dirty bucket of water sitting in the corner and heads to the issue. But wait, what is the purpose of this? How can you clean up a spill with old, outdated, dirty tools? Just what is going to be the outcome if you keep doing the same thing? NO MORE. The task is to remove the materials and liquids from the floor and leave the area like it never even happened and to do it in the least amount of time. If you are the Technician doing the job, you also want to do it with the least amount of effort too. Whether it is dry debris or wet matter on the floor, the new method is to grab a squeegee on a handle and pull the materials into a plastic liner. The liner is then dropped off the holder into a trash can, rinsed clean and ready for its next call to duty. Take a bucketless microfiber mopping tool, drop the cleaning solution on the small amount of film left, mop it up and your done. To see this healthy, positive and proactive process in action, take a look at this short video. Want to learn more ‘Best Practices’ from the A.C.E. 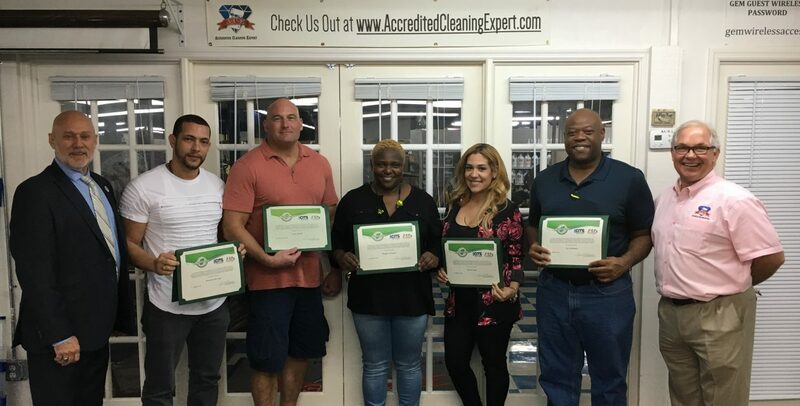 Academy of Cleaning Excellence, go the EDUCATION tab on our website and see when the next class you need, is scheduled.